Red Dead Online Robbing Trains - Is it Possible? Home » Red Dead Redemption 2 » Red Dead Online Robbing Trains – Is it Possible? Trains are a means of transportation in Red Dead Redemption 2 Online. They can help you cross the map more quickly than riding a horse can, and they’re a different kind of fun. In the singleplayer part of the game, they could be robbed for a solid profit, which is why a lot of people are asking can you rob trains in Red Dead Online. This guide will show you exactly what you can and cannot do with trains in RDR2 Online, so you won’t have to wonder anymore. Can you rob trains in RDR2 Online? In singleplayer, trains were first and foremost a mode of fast travel. You could buy a train ticket at one of the many stations across the map, wait for the iron snake to slither to the platform, then take a seat and enjoy the view while it takes you wherever you’re heading. It was more costly than simply riding a horse, but it was considerably faster, and you couldn’t be attacked by bandits or wild animals. That part of the equation is no longer. 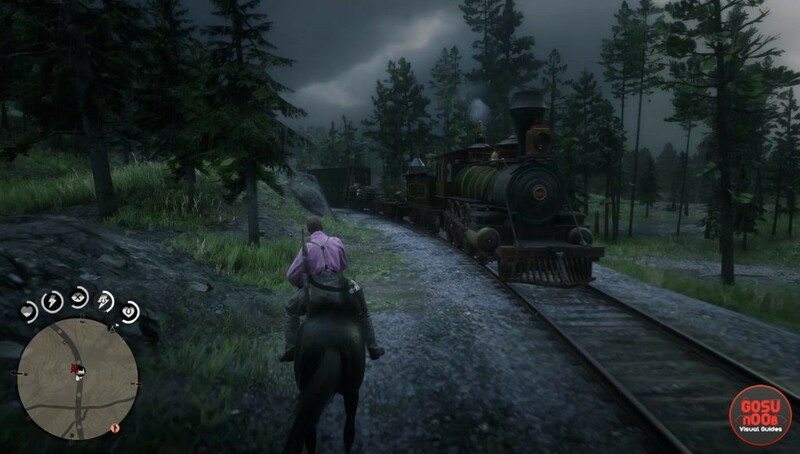 Trains can’t be used as fast travel in RDR2 Online, which means you’ll have to ride a whole lot. It’s going to help you save money, but you’ll spend a fair bit longer getting from place to place. When playing as Arthur, you could also steal a train and drive it yourself. Whenever you saw one, you could jump on it, beat up the driver and take his place. This is still possible, except this time, the driver won’t be an NPC, but another player. The only trains we’ve seen in Red Dead Online were stationary. If you open up the map and flip through the filters, you’ll quickly find a train icon. It will point you towards any trains in your instance. Even if it’s parked, you can still board a train and take the proverbial wheel. However, the most important aspect of trains in singleplayer were the robberies. They allowed you to earn a quick buck by jumping a passanger train, dealing with the two or three guards, then demolishing the safe and grabbing whatever’s inside. There was also the option to steal valuables from the passangers by threatning them with violence. It was quick, easy and satisfying. You could always summon another train by buying a ticket at any of the stations, and there was a way to rob a train without getting bounty. It was perfect. Sadly, you won’t be doing none of that in Red Dead Redemption 2 Online, since you can’t rob trains. There’s a very simple reason for this – we’ve tried reloading instances several times, and all the trains we saw were freight trains. There wasn’t a single passanger train. They did contain a few items here and there – a tonic or a handful of bullets – but there was no safe, no valuable items to be stolen and no people to be robbed at gunpoint. Hopefully this is something that’s coming in a future update, something Rockstar is saving for later because they think there’s enough stuff to do in the game for now. Based on our experience with the online beta, though, the developers don’t want to make it easy to earn money. They want players to struggle and make every dollar count, and so all of the most profitable activities from the singleplayer have been removed. If that is the case, then don’t expect to see any of those any time soon – you’ll have to grind your way from the bottom if you want that money. Great write up. Im very dissapointed in finding exactly what you did….no trains to stop..no driver to kill..no passengers to rob!!?? The train is dead on the tracks in multiplayer and I think it always will be..
Oh it isn’t always dead. If you see it moving, rest assured another player(s) are riding it. The other day my camp was beside the tracks and the train came with 2 guys on it. They stopped it and proceeded to try to murder me in my camp. When they realized they couldn’t stab, rope, or shoot me, one tried to throw dynamite on me. Sadly for him, he didn’t realize his horse (they follow the train their rider is on) had followed him into my camp and was standing where he dropped his dynamite. Blew up his horse. He revived it, then ran back to the train and they headed on out… just in time to run over the newly revived horse who had wandered onto the tracks in front of the train. Almost everything outlawish and fun you could do in the open world singleplayer isnt in online, you cant interact with npcs besides killing them, cant holdup shops, the bounty system is gone so theres no real consequence to committing crimes. Wheres all the cowboy stuff that im sure not just myself was eager to do with my friends? Really dissapointed that theres not even proper trains to rob nor banks.